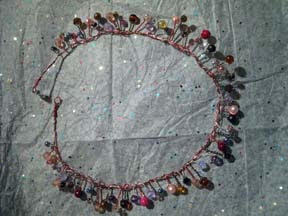 Today was my 2nd Bead and Wirework Class, I had done my homework so I turned up with 3 lengths of wire with beads twisted on, waiting to be assembled,here is the finished necklace which I was very pleased with,it is actually something I will wear not just a sample piece, we also went through the different diameters of wire we will be using and the tools we need to use, next week we will be making jump rings which we were shown before we finished the class I am quite interested in this as I would like to have a go at making chain mail jewellery which uses alot of jump rings so I think it will be cheaper to make them myself. I also signed up for TUSAL(Totally Useless Sal) this week anyone who doesn't know what this is they can look Here . You keep all your thread waste, labels or material scraps in the Jar(clear container) then on the New Moon each month you post a picture of how you Jar is filling, Feb 14th is the next New Moon . Jayne I love your necklace. 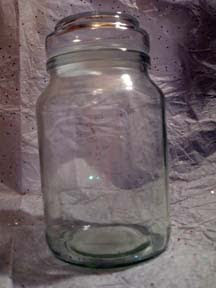 I also joined in the TUSAL and your jar is similar to mine. I can also put things in the lid too. Oh Jayne, this necklace looks fantastic. Great job. I also love the progress picture of the birth sampler in your last post.